Ivanka Trump, the president's daughter and a White House aide, said Thursday that she doesn't agree with her father's phrase to describe the news media. WASHINGTON — White House Press Secretary Sarah Sanders lashed out at the press on Thursday while declining to directly answer whether she agreed with President Donald Trump's repeated use of the phrase "enemy of the people" to describe members of the media. Last week, The New York Times publisher A.G. Sulzberger said he confronted Trump over the phrase last month in a meeting, citing it as an example of "inflammatory language [that] is contributing to a rise in threats against journalists and will lead to violence." Pressed by CNN's Jim Acosta, who has often clashed with the White House, to personally distance herself from the term given her role as a public liaison to the press, Sanders said "the president has made his position known." She then went on to criticize Acosta and other outlets over an array of topics. "It's ironic, Jim, that not only you and the media attack the president for his rhetoric, when they frequently lower the level of conversation in this country," Sanders said. "Repeatedly, repeatedly, the media resorts to personal attacks without any content other than to incite anger. The media has attacked me personally on a number of occasions, including your own network, said I should be harassed as a life sentence, that I should be choked." The "choked" line was a reference to MSNBC host Nicolle Wallace, who apologized in May for "poorly chosen words" after she asked a reporter after a press briefing, “How do you resist the temptation to run up and wring her neck?" Wallace said the phrase was meant to evoke exasperation with Sanders' response to questions about a White House staffer who reportedly joked about cancer-stricken Sen. John McCain, R-Ariz., dying. Sanders also referred to the White House Correspondents Association's annual dinner this year, in which comedian Michelle Wolf mocked her in a speech. Wolf is not a member of the White House press and comedians traditionally use the event to poke fun at political figures, but the WHCA nonetheless condemned her comments, which critics said went too far by touching on her physical appearance. Relations between the press and the White House have been especially sour in recent weeks. The administration blocked a CNN correspondent from an event after she shouted questions to the president at an event, a routine practice among correspondents, while serving as the White House pool reporter. The WHCA strongly condemned the move, with president Olivier Knox calling it "wholly inappropriate, wrong-headed, and weak." Sanders was previously asked on Wednesday whether the White House thought it was appropriate for Trump supporters to heckle reporters at a rally in Tampa this week. 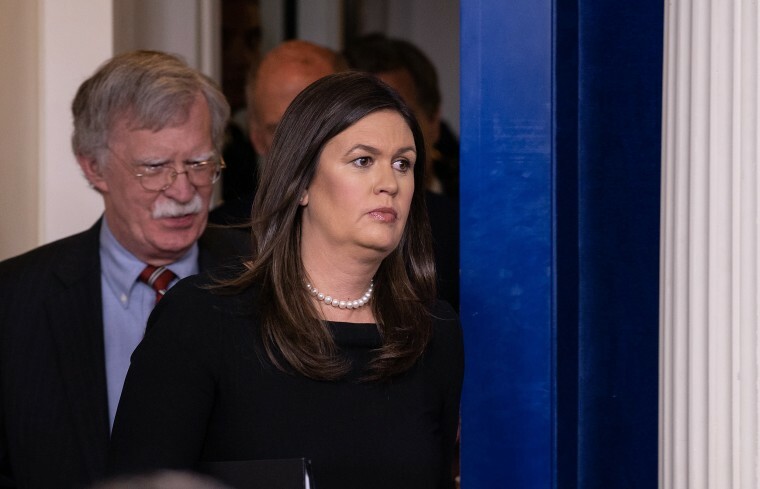 She responded that the White House condemns violence, but also criticized news outlets over a decades-old accusation that a newspaper revealed key intelligence about Osama bin Laden's use of a satellite phone in the 1990s that damaged efforts to capture or kill him. The Washington Post reported in 2005 and again this week that the claim, while widely repeated after 9/11, is unlikely to be true. Ivanka Trump, the president's daughter and a White House aide, said at an Axios event on Thursday that she doesn't agree with the "enemy of the people" tag. “I’ve certainly received my fair share of reporting on me personally that I know not to be fully accurate, so I have some sensitivity around why people have concerns and gripes, especially when they sort of feel targeted, but no, I do not consider the media the enemy of the people," she said. The president responded to his daughter's comments on Twitter, claiming their views are actually in alignment.